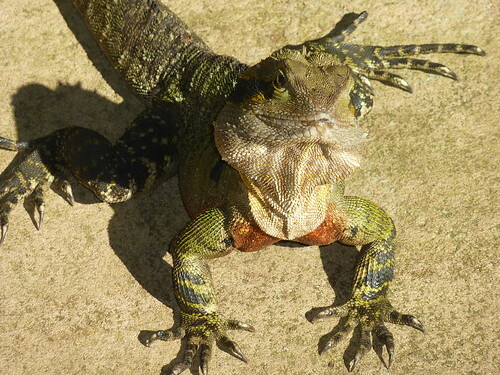 When we were in Vietnam we'd met an Australian mother and daughter, Karin and Helen, on the Ha Long Bay trip, and they'd kindly invited us to stay with them when we got to the Gold Coast. We got in touch and - even though it was Mother's Day in Oz - Helen told us to come along and join them for a family dinner. We drove down to Helen and her boyfriend Andrew's house, not too far from Surfer's Paradise, and went in convoy to her parents' place. Helen's parents live on a farm in NAME OF PLACE?? and have a wonderful farmhouse with three dogs. 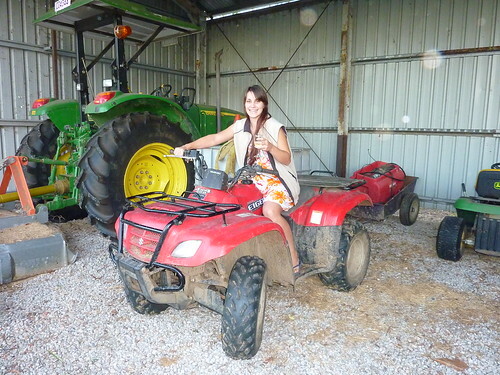 With true Australian hospitality, Karin pressed a glass of wine into our hands, and told Helen to take us out on a quad bike to have a look around the farm and adjoining fields. 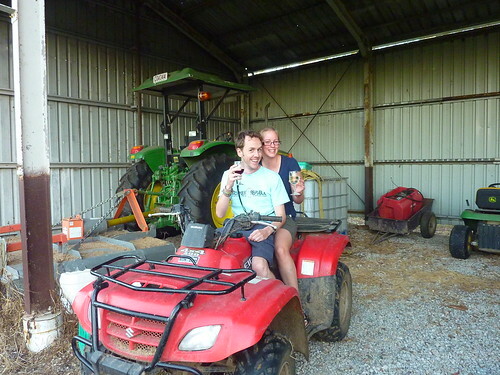 You may think that wine and quad bikes don't make a good combination; look upon the following photos and be proven wrong! Even though I was born in a farming county, I'd never seen a hen house like this before. 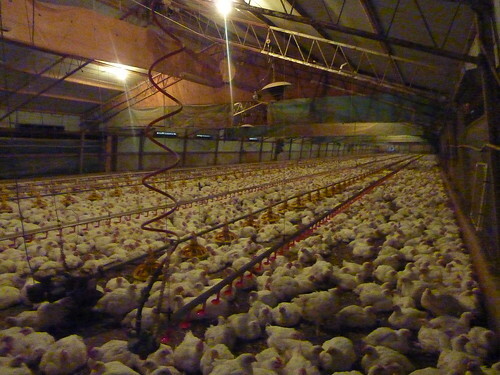 I think Andrew said there were over 10,000 hens in each house (I may be mistaken); that's a lot of eggs. They had a bit of room to move around so weren't completely cooped up - or worse, caged. And they looked tasty. We drove back to the house and I whipped up some of my World Famous Yorkshire Puddings to go with Karin's roast, which were a totally alien concept for the Aussie crew, but seemed to go down pretty well. Mama and Papa Swift made us feel completely at home, and ensured we were well fed and watered for our entire stay which was much appreciated. We stayed overnight, and said goodbye to Karin early the following morning. 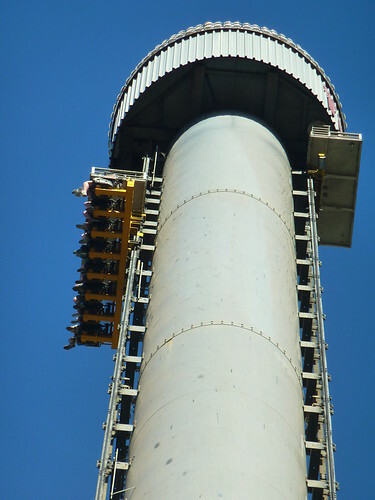 This was probably my favourite ride; you're lifted up to a crazy height of 119m and then the ride just pauses, giving you ample time for the suspense to drive you slightly loopy before the whole thing just drops and it feels like the floor has fallen away from you and you plummet, yelling in utter terror before the brakes kick in and slow you down. And then you get off, and do the whole thing again. 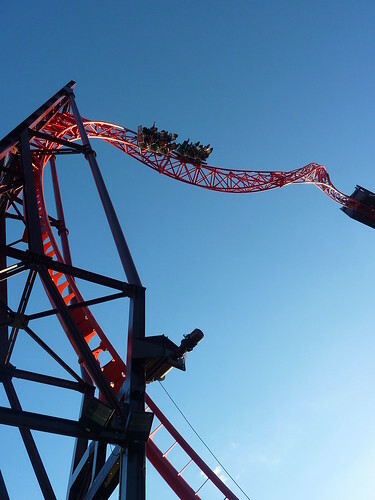 There were plenty of great rides in Dreamworld, and in my opinion it was a lot better than Alton Towers or any of the many UK theme parks we'd been to. Even the obligatory fast food court was decent, as long as you didn't mind being watched by a dozen hungry birds. Tip: don't leave your food unattended at any time. 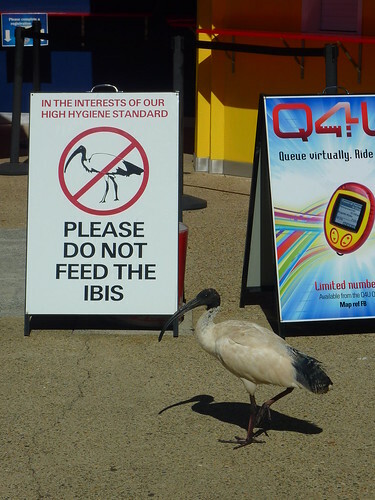 The ibises have worked out how to open every fast food carton, box and cup and aren't shy about their hunger. The great thing about visiting the parks in winter is that most of the locals consider it too cold to visit (especially the water park) so both places are practically deserted. We were able to walk straight onto almost every wide - no queueing for 2 hours at a time here! We got back to Helen's in the evening, feeling exhausted (G-Force has that effect) and found that Helen, Andrew and two of Andrew's three brothers were putting home-made pizza on for us. Paul and Fi also joined us in the evening and a great time was had by all, in true Milton fashion. 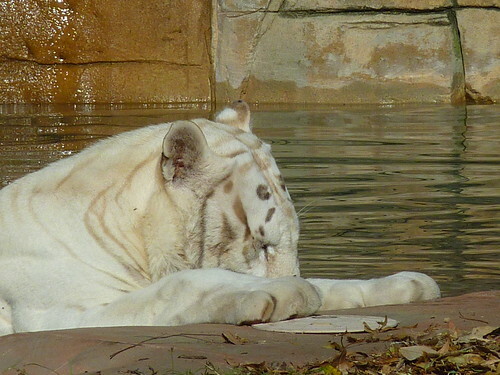 The next day was similar to the previous one, except this time we went to Whitewater World and got very wet. Thankfully the sun stayed out all day, as the temperature was approaching a level of coldness we weren't that used to after seven months in the sun. 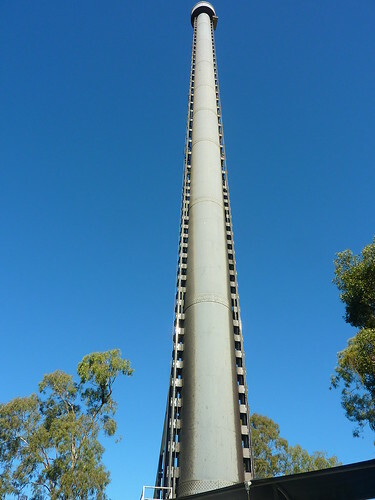 Regardless, the water rides were excellent - especially the Super Tubes Hydrocoaster which used magnets to pull you uphill in a two-berth dinghy at an incredible speed before chucking you down water tubes. We decided to return the favour that evening and after a visit to a local Coles, cooked a Thai curry for Helen, Andrew and Simon which worked out surprisingly well (especially the prawn crackers). 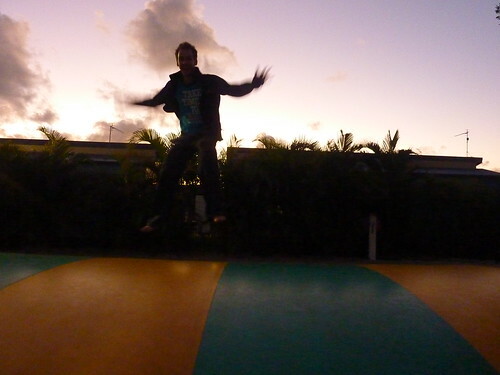 Sadly, we had to leave the following day and carry on down the Gold Coast. Paul and Fi had a tight timescale and had to meet one of Fi's relatives in Sydney sooner than our expected arrival, so had left the day before when we were in the water park. 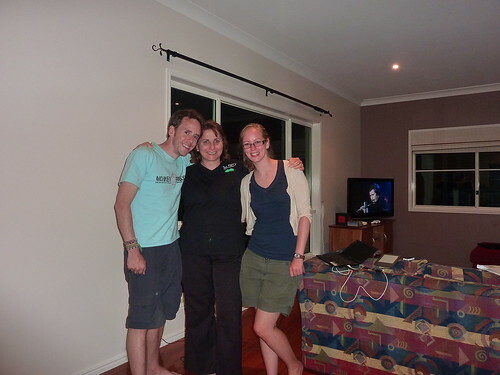 We said goodbye to Helen, Andrew and Simon, and set off for Surfer's Paradise. 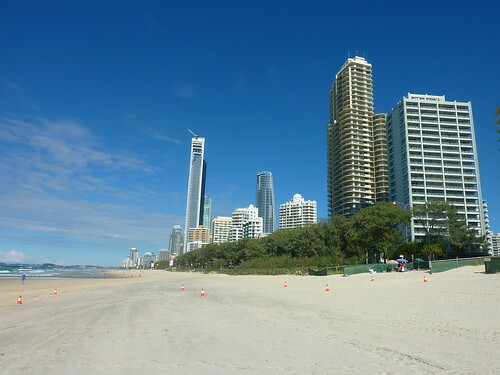 This wasn't high on our places to visit, as it was just another beach - albeit one with highrise blocks overlooking it. 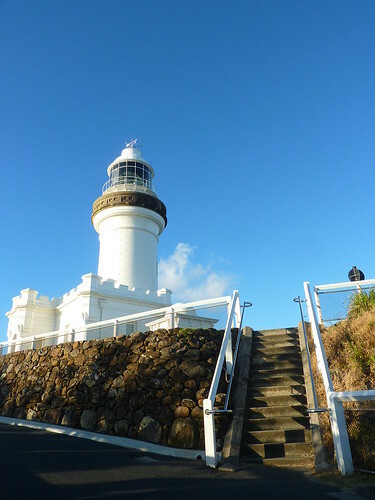 After a brief stroll, we carried on to Byron Bay. 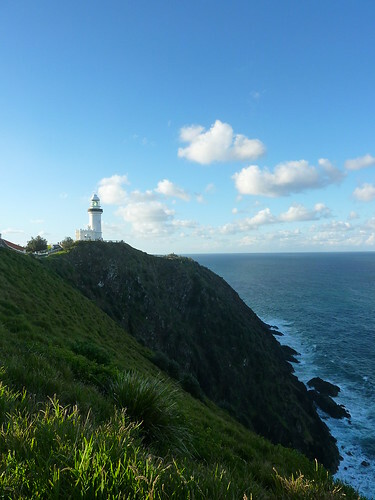 Cape Byron has a lighthouse (not accessible to the public) which overlooks a bay that whales can often be seen from as they migrate each year. 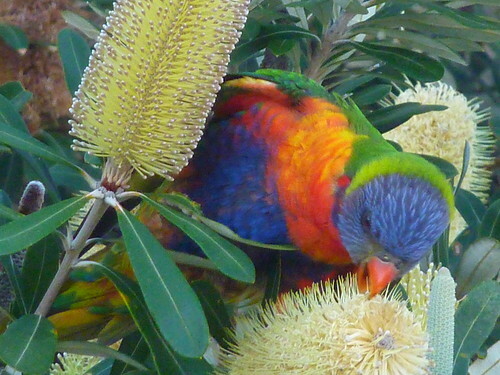 There are also parrots a-plenty in the trees around the area. It was a lovely place to visit, made even better by the Byron Bay Cookies we found in a local shop. 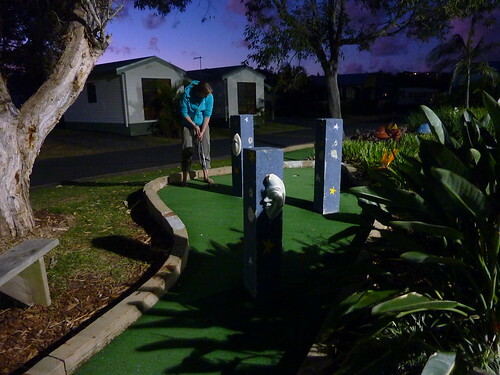 The caravan park we stayed in that evening had a heap of amenities, not least an inflatable pillow and a mini-golf course. We wrapped up well, as the evenings were definitely starting to cool down, and gave them both a go. 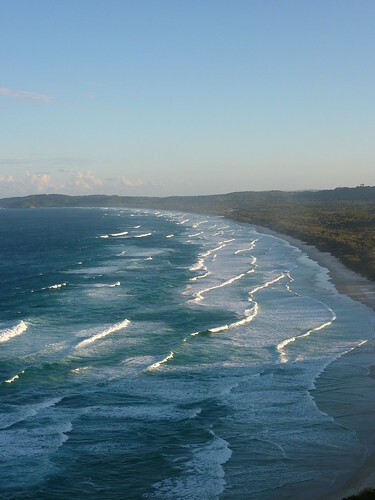 Our inexorable drive south was to continue the next day towards Coffs Harbour.